Music and entertainment have definitely been one of the toughest choices we have had to make in planning our big day. It is probably because music is so important to us. Our journey to becoming husband and wife all started musically with the serenaded proposal. Obviously, being Scottish, having a piper during the day was an absolute must. There is something incredibly moving and patriotic about hearing the bagpipes (unfortunately Tim is not as keen). We decided to have a piper play while guests arrive. We have also spent considerable time deciding the most fitting songs for the ceremony and what to play during the day before the proper party starts in the evening. Evening entertainment was a priority for us, so we allocated a good proportion of our budget towards that and decided against having live entertainment during the day. Our focus is on pulling together our perfect playlist that means something to us, which we can play during the drinks reception via the PA system at The Barn @ Barra. We are hoping the Aberdeenshire weather holds out, so we get the opportunity to use the amazing outdoor space at the front of the Barn @ Barra. We have hired lawn games from Amy at Cymbeline Events including giant Jenga, Connect Four, Croquet and a Bean Bag Toss game. We thought it would be a great way to make the most of the location as it is so spectacular with the views of Bennachie in the background. It will also be ideal for the guests to get to know each other over a glass of Pimms and a game of croquet! Initially, we had decided to just book a DJ for the evening. My brother helped me organise a DJ from Touch of Class in Aberdeen. However, after going to a function and hearing a particular band, we realised we would love to have a band for at least part of the night. I think it really adds to the atmosphere and I love a ceilidh. Luckily, they were available on our date. This is one of the significant advantages of booking a weekday wedding – we have managed to secure our first choice of suppliers every time. 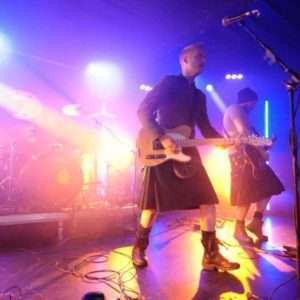 We booked Bahookie which is a contemporary Scottish rock band that mix your typical ceilidh music with urban dance and rock music. They are right up our street, and the fact they are different from the average Scottish band really appealed to us. After the Bahookie set, we will have the original DJ that we booked through Touch of Class. I think this gives the perfect mix of both our tastes and hopefully, ensures that all the guests’ tastes are catered for too. Ultimately, we want everyone to have fun and enjoy themselves. Hopefully, we will achieve that with what we have gone for in our budget, and the dancefloor will be packed all night! 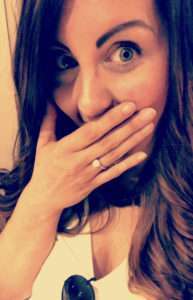 Next month, we will cover the day I said ‘YES’ to the dress! Take the opportunity while at weddings or other events to draw inspiration for the type of entertainment or music you are looking for. Don’t feel like you need live entertainment for every part of the day; a well-made playlist can have a great impact and add a personal touch. Make the most of any recommendations, referrals or contacts through friends or family to help book your entertainment, but make sure to do your research too as musical taste is always subjective! Get song requests in advance and make sure guests enjoy the music by asking what song they would love to hear on the night as part of their RSVP.